Bathtub Reef Beach on Hutchinson Island in Stuart, Florida last Sunday around noon. Red flag advises against swimming but does not forbid it (that would be two red flags). I walked south to the inlet and back, 2.2 miles, for an hour and 45 minutes, watching and counting birds. Here’s my eBird checklist: Oct 7 Bathtub Beach. When little shorebirds are holding still, it’s hard to see them. These people walked right past and didn’t seem to notice the plovers. Fancy houses along the beach here. It’s the gated community of Sailfish Point, right at the southern tip of the island. Can’t get in unless you live there – although you can walk along the beach. A small dark shorebird with a single band across its chest, the Semipalmated Plover is the most common plover seen on migration in most areas. The most common of the small plovers on migration through most areas. On its breeding grounds in the north, it avoids the tundra habitat chosen by most shorebirds, nesting instead on gravel bars along rivers or ponds. In such surroundings, its seemingly bold pattern actually helps to make the plover inconspicuous, by breaking up its outline against the varied background. The name “semipalmated” refers to partial webbing between the bird’s toes. Willets flew in for a short visit. A Ruddy Turnstone was digging into a sea turtle shell. The turnstone was very busy. I watched it rushing here and there, pushing away bits of sargassum , sticks and shells to see what was underneath. “It’s turning ‘stones’ like a turnstone!” I thought. Best known for habit of inserting bill under stones, shells, etc., and flipping them over to find food underneath. Several birds may work together to overturn a larger object. Often probes under seaweed or debris. Gusty east wind and strong surf. Brown Pelican can handle it. 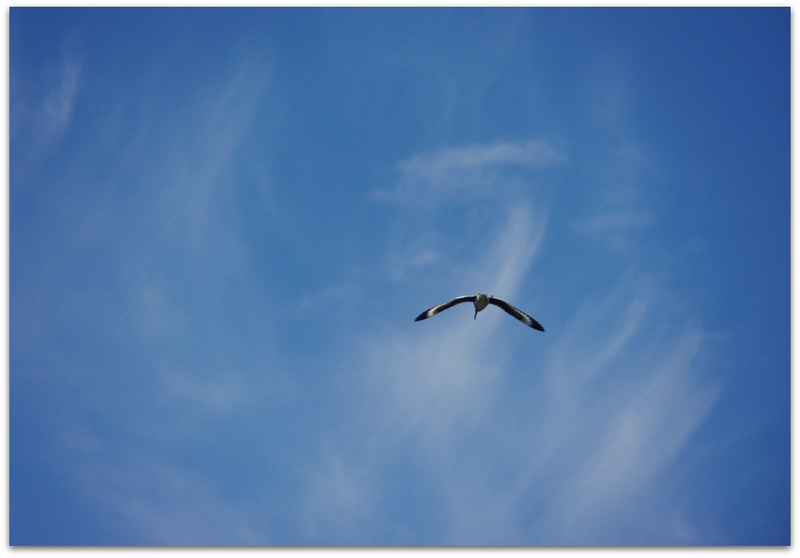 Brown Pelicans have a wingspan between 6.5 and 7.5 feet. They are the smallest of the eight pelican species, but still very big birds. Getting closer to the inlet, I came upon a bird I’ve only seen once before: a Black-bellied Plover. It relocated as I walked past on the high part of the beach, but didn’t go far. Nice view of wings and tail. This stocky plover breeds in high Arctic zones around the world, and winters on the coasts of six continents. Some can be seen along our beaches throughout the year (including non-breeding immatures through the summer). Although the Black-bellied Plover is quite plain in its non-breeding plumage, it adds much to the character of our shorelines with its haunting whistles, heard by day or night. Most migrate along coast or over sea, but numbers stop over regularly at some inland sites. Winter range remarkably extensive, from New England and southwestern Canada to southern South America, Africa, Australia. The other time I spotted these birds was at Ragged Neck in in New Hampshire in Nov. 2016, along with some Snow Buntings. A couple of guys on jetskis were playing in the waves near the inlet. I see these sandpipers a lot in non-breeding season. You don’t see too many fishermen at this spot since they have to walk a ways to get here. Looking across the St. Lucie inlet from Hutchinson Island to Jupiter Island. And Sanderlings running along the sand. Little Blue Herons… an adult on the rocks and an immature in the water. Yes, the young ones are white not “blue”. View west from the inlet. The St. Lucie River and Indian River Lagoon connect to the Atlantic Ocean here. Sandwich Tern, a tern I know thanks to the yellow bill tip! This entry was posted in Uncategorized and tagged Black-bellied Plover, Brown Pelican, Little Blue Heron, Ruddy Turnstone, Sanderling, Sandwich Tern, Semipalmated Plover, Willet on October 9, 2018 by Amy. Birds and people at Chastain Beach a few mornings ago. White Ibis seems interested in this Willet. Willet seems a bit annoyed by White Ibis. What does White Ibis want? Willet wants to be left alone. The following persisted right around me and into the rocks looking toward Bathtub Reef Beach. 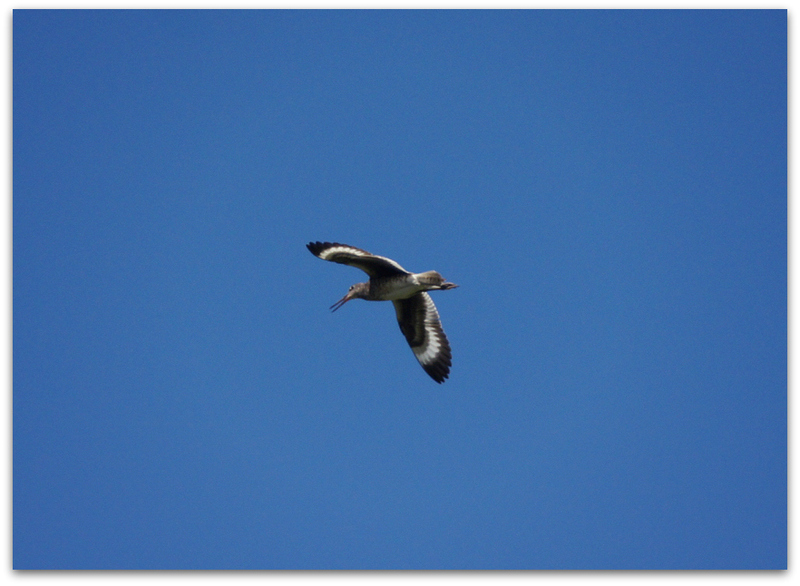 This entry was posted in Uncategorized and tagged White Ibis, Willet on September 24, 2018 by Amy. I collected some Willets for the blog a week and a half ago on Sanibel. We were at Lighthouse Beach on the south end of the island. A flock of Willets flew from somewhere over the Gulf and landed on the beach. Also washed up on the beach: lots empty tubes of marine parchment worms. This was the first time I’ve seen a flock of Willets. On our beaches I see them in ones and twos. This one found a tiny crab. Willets and other shorebirds were once a popular food. In his famous Birds of America accounts, John James Audubon wrote that Willet eggs were tasty and the young “grow rapidly, become fat and juicy, and by the time they are able to fly, afford excellent food.” By the early 1900s, Willets had almost vanished north of Virginia. The Migratory Bird Treaty Act of 1918 banned market hunting and marked the start of the Willet’s comeback. These Willets came in two different colors: grayish brown with few markings and grayish brown with more brown mottling and markings. The more mottled plumage is a breeding adult, according to Cornell, vs the smoother non-breeding adult. There. Now we’ve had a good look at Willets. This entry was posted in Uncategorized and tagged Willet on August 4, 2018 by Amy. Willet at Chastain Beach, Stuart, Florida a couple of days ago. Willets seem to be here on South Hutchinson Island year round. They are usually alone when I see them. Feeding both during the day and at night, Willets take most of their prey from the surface, using their sensitive bill tip to grab up worms, snails, and insects. They also probe for sand crabs and other prey on mudflats and beaches, and take shellfish and small fiddler crabs from rocky shorelines. You’ll usually see them on wetted shorelines or wading close to the water’s edge, but occasionally Willets paddle in shallow waters to chase down small fish and crabs. One Willet and one beachcomber. A short walk south, at Bathtub Reef Beach (closed now for renourishment and repairs) a Great Egret was fishing out by the reef. Rough seas offshore, calm water behind the reef. This entry was posted in Uncategorized and tagged Great Egret, Snowy Egret, Willet on April 19, 2018 by Amy. Ruddy Turnstone rests out of the wind in a footprint. A shorebird that looks almost like a calico cat, the Ruddy Turnstone’s orange legs and uniquely patterned black-and-white head and chest make them easy to pick out of a crowd. These long-distance migrants breed in the arctic tundra, but spend the off seasons on rocky shorelines and sandy beaches on both North American coasts (as well as South America, Eurasia, Africa, and Australia). The willet (Tringa semipalmata), formerly in the monotypic genus Catoptrophorus as Catoptrophorus semipalmatus, is a large shorebird in the sandpiper family. It is a relatively large and robust member sandpiper, and is the largest of the species called “shanks” in the genus Tringa. These rocks are part of the Anastasia geological formation. They are quite striking near the House of Refuge on Hutchinson Island. Also taking a break from feeding, a Sanderling. The beach, looking north. We stopped by yesterday in the late afternoon to see if there were any more falcons coming through. There were not. But this little Sanderling landed right next to me and let me take a few photos. Pretty plumage. Sweet little birds. The Sanderling’s black legs blur as it runs back and forth on the beach, picking or probing for tiny prey in the wet sand left by receding waves. Sanderlings are medium-sized “peep” sandpipers recognizable by their pale nonbreeding plumage, black legs and bill, and obsessive wave-chasing habits. Learn this species, and you’ll have an aid in sorting out less common shorebirds. These extreme long-distance migrants breed only on High Arctic tundra, but during the winter they live on most of the sandy beaches of the world. Welcome back to your “winter” home! This entry was posted in Uncategorized and tagged Ruddy Turnstone, Sanderling, Willet on October 7, 2017 by Amy. Two Willets walking on a beach, St. Lucie Inlet Preserve State Park. This is the little sandpiper that runs up and down the beach “like a clockwork toy,” chasing the receding waves. Plumper and more active than most small sandpipers, and quite pale at most times of year, a good match for dry sand. Sanderlings nest only in limited areas of the far north, but during migration and winter they are familiar sights on coastal beaches all over the world. This entry was posted in Uncategorized and tagged Sanderling, Willet on March 19, 2017 by Amy. Willet in the surf at Bathtub Beach last Thursday. Willets are often seen alone. They walk deliberately, pausing to probe for crabs, worms and other prey in sand and mudflats, or to pick at insects and mollusks. A couple of Willets plus a Sanderling for size. Ruddy turnstones. I see a lot of these but have not yet blogged them. The ruddy turnstone (Arenaria interpres) is a small wading bird, one of two species of turnstone in the genus Arenaria. The scientific name is from Latin. The genus name arenaria derives from arenarius, “inhabiting sand, from arena, “sand”. The specific interpres means “messenger”; when visiting Gotland in 1741, Linnaeus thought that the Swedish word Tolk “interpreter” applied to this species, but in the local dialect the word means “legs” and is used for the redshank. This entry was posted in Uncategorized and tagged birds, Florida, Ruddy Turnstone, Sanderling, Willet on January 22, 2017 by Amy. A Willet on the rocks, at Ross Witham Beach near the House of Refuge. The willet (Tringa semipalmata), formerly in the monotypic genus Catoptrophorus as Catoptrophorus semipalmatus, is a large shorebird in the sandpiper family. It is a good-sized and stout scolopacid, the largest of the shanks. The Anastasia Formation, named by E. H. Sellards in 1912, is composed of interbedded sands and coquina limestones. The formation is an orangish brown, soft to moderately hard, coquina of whole and fragmented mollusk shells within sand often cemented by sparry calcite. Makes a nice Willet perch. This entry was posted in Uncategorized and tagged Anastasia formation, birds, Willet on January 12, 2017 by Amy. Made it just in time to see the first sunrise of 2017! That seems lucky. Husband and I took the dog to Santa Lucea Beach on Hutchinson Island for his morning beach run, chasing the ball over and over. Fishermen were catching bluefish. People were taking photos of the sun and the ocean. It is so great to go to bed early and then get up early for the New Year. That’s how it is when you are 50-something. My first photographed birds of the New Year: grackles running around at the gas station. I fueled up and my husband got us some coffee. Here he is watching the birds while the birds watch him back. Common Grackles are blackbirds that look like they’ve been slightly stretched. They’re taller and longer tailed than a typical blackbird, with a longer, more tapered bill and glossy-iridescent bodies. Grackles walk around lawns and fields on their long legs or gather in noisy groups high in trees, typically evergreens. Grackles are old friends of mine, ever since the day I made that wish that came true. We stopped at East Island under the bridge next, to rinse the sand off the dog with a swim in the Indian River Lagoon. I spotted this solo Willet. These long-legged, straight-billed shorebirds feed along beaches, mudflats, and rocky shores. Willets are common on most of our coastline—learn to recognize them and they’ll make a useful stepping-stone to identifying other shorebirds. East Island under the Ernest Lyons Bridge, with John, Radar and a fisherman wearing one of those straw hats I want. Also at East Island, a Little Blue Heron. More gray and purple than blue, if you ask me. Morning light is so nice. Happy New Year to all my bird, dog, and human friends! This entry was posted in Uncategorized and tagged birds, Common Grackle, Florida, Little Blue Heron, New Year, Willet on January 1, 2017 by Amy. A Willet flapped and called noisily over my head on a walk near Rye Harbor a couple of days ago. Piercing calls and distinctive wing markings make the otherwise subdued Willet one of our most conspicuous large shorebirds. Whether in mottled brown breeding plumage or gray winter colors, Willets in flight reveal a bold white and black stripe running the length of each wing. 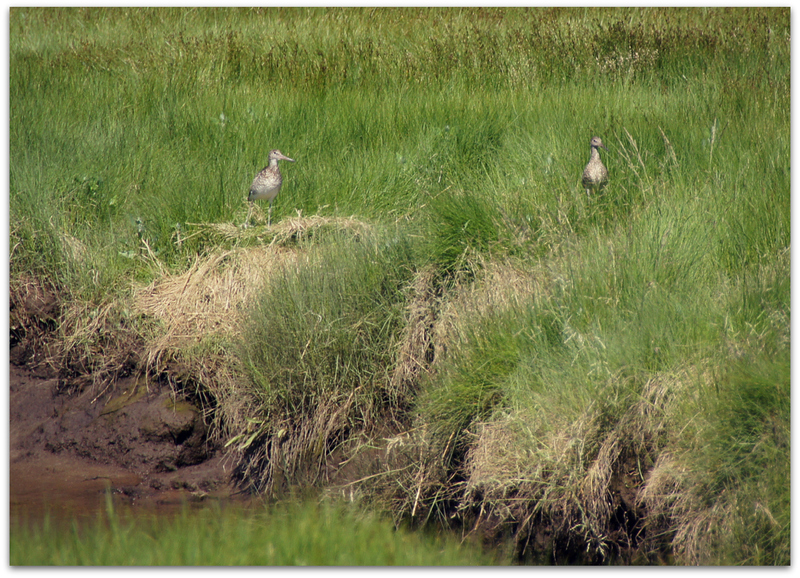 The Willet pair may have been nesting in the marsh off Locke Road. They took turns strafing me. This entry was posted in Uncategorized and tagged birds, Willet on June 27, 2015 by Amy.